It was another big week for Placer United’s 2003 U15 player, Kellie Pagador. She received two pieces of news from U.S. Soccer and, in particular the technical staff of the U.S. Soccer Girls Development Academy. 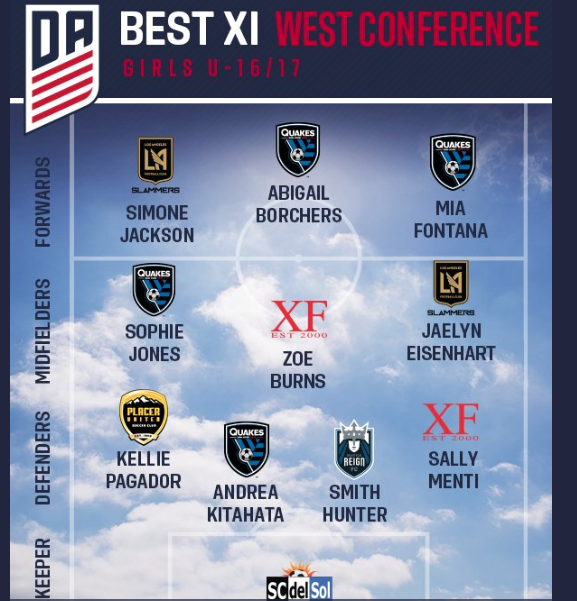 The first bit of news was to inform Kellie she had been named to the U17 (2001 age group) West Conference U.S. Soccer Development Academy starting eleven. Kellie now joins former Placer United players Seth Caspile, Connor Hallisey and Grant Silvester as the fourth player and the fifth member of the Club to be honored by US Soccer. Last year Jodi Tarr was named U.S. Soccer Development Academy Administrator-of-the-Year. The second piece of news for Kellie was the invitation to pack her soccer bag and join up with the Women’s U17 U.S. Soccer National Team in Kansas City to prepare for the U17 Women’s World Cup. The tournament will take place in Uruguay in November. Kellie is one of only three 2003 age group players who were selected to attend the 2001 National Team camp. Great job, Kellie and congratulations from all of us!